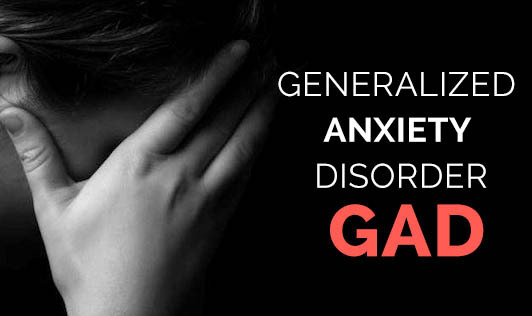 GAD is a common anxiety disorder that involves chronic worrying, nervousness as well as tension. Generalized anxiety disorder is a general feeling of dread or unease that colours one's whole life. It is less intense than a panic attack but is long lasting, making normal lie quite difficult and relaxation impossible. Generalised anxiety disorder comes on gradually, often hits people in childhood or adolescence, but it can also begin in adulthood. What are the signs and symptoms of GAD? The signs and symptoms of GAD fluctuate and not everyone with GAD has the same symptoms. But most people with GAD experience a combination of emotional, behavioural and physical symptoms. Note that the core symptom of GAD is chronic worrying and it's important to understand what worrying is since the beliefs that you hold about worrying play a vital role in triggering and maintaining GAD. • Practice relaxation techniques such as progressive muscle relaxation technique, deep breathing or meditation. • Connect with others as GAD gets worse when you feel powerless and alone. • Identify unhealthy relationships and know who to avoid when you're feeling anxious. • Adopt healthy eating habits because going too long without eating leads to low blood sugar which can make you feel anxious and irritable. • Limit or stop caffeine and sugar intake as caffeine can increase anxiety, interfere with sleep and even provoke panic attacks. Sugar on the other hand can cause blood sugar to spike up and then crash leaving you feeling emotionally and physically drained. • Exercise regularly as this is a natural and effective anti-anxiety treatment. Exercise relieves tension and stress, boosts physical and mental energy and enhances well-being through the release of endorphins which are the brain's feel good chemicals. • Get ample amount of sleep because lack of sleep can also contribute to anxiety and your ability to handle stress is compromised. • Lastly, avoid alcohol and nicotine as these can lead to higher levels of anxiety. Please see a mental health professional if you can't seem to shake your worries and fears despite trying self-help strategies. Remember that self help doesn't replace professional treatment.